other information Cian 001, 1998. Recorded in Ennis, Co. Clare. The publication year is ambiguous: "Copyright - Cian 1998" is printed on the disc, while"Copyright Cian 1999" is printed on the package tray label. 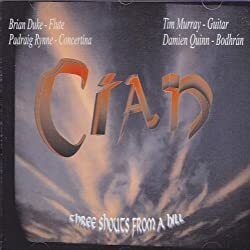 According to <http://homepage.tinet.ie/~cianmusic/tour.html> viewed 13 June 2013, the album was officially launched on 16 February 1999 in Galway.